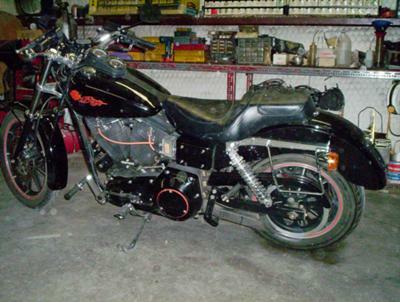 I have a 1991 Harley Davidson Sturgis for sale that has only 63K original miles and many tasteful extras. This Harley Sturgis motorcycle is in showroom condition, must be seen to be believed and you'll be amazed at the value you will be getting for such a cheap price. When you call you can rest assured that Dave can answer any questions that you may have and list all of the extras that have been put on this custom motorcycle in detail as he has done all the work and has been running his own motorcycle shop for approximately 30 years. comparisons of what other Sturgis models are going for compared to what I am asking. You will not want to pass up this opportunity to get one of the best deals going for this particular bike! This is one of the best models that Harley Davidson has ever made and you will see that Dave has customized it and made it even better. Please send any questions you may have regarding the 1991 Harley Davidson Sturgis along with your contact information in the space below provided by GoGoCycles Used Motorcycles for Sale and Dave will get back with you with details as soon as possible. GoGoCycles would also encourage bikers to submit a review of the 1991 Sturgis Harley for sale to help potential buyers make informed decisions and to benefit the biker community as a whole. What is the price tag on this bike?